The jubilant Naim MRT team upon successful completion of installation works. KUCHING: It was a euphoric moment for Naim Engineering Sdn Bhd’s (Naim) Mass Rapid Transit (MRT) team when they successfully installed the 55.39-metre and 165.2-metric tonne MRT pedestrian Link Bridge A. Standing 19 metres above ground, the link bridge connects the Phileo Damansara MRT Station to the station’s Entrance A and cuts across Kuala Lumpur’s busy Sprint Highway. 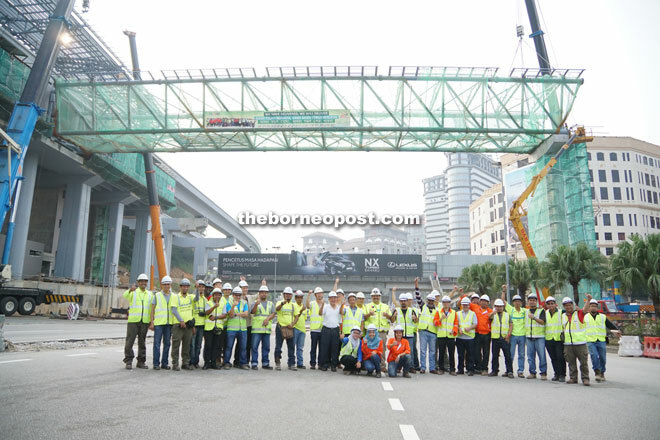 It is the first section of such bridge to be installed, with the second section to be installed this coming weekend, said Naim in a press statement. In 2012, Naim became the first East Malaysian contractor to be awarded two stations packages under the multi-billion ringgit Klang Valley Mass Rapid Transit (KVMRT) project: Stations Package S4, which includes Section 16, Pusat Bandar Damansara and Semantan, and Stations Package S2, which includes Taman Industri Sungai Buloh, PJU 5 and Dataran Sunway. Naim chief operating officer (Construction), Sivakumar Ramasamy, said the installation works, which commenced last Saturday, were completed yesterday morning. ‘This is a momentous occasion for us. The bridge which involved complex steel works, was assembled on ground. Upon completion, it was loaded onto a multi-axial loader and shifted to the lifting point before it was finally lifted to its position. “Our team members worked day and night for the past few days to ensure the successful installation of the bridge and remained vigilant throughout the entire process. Our Group managing director, Datuk Hasmi Hasnan, was also with us throughout the works and his presence accorded us the moral support we needed for this challenging task. “We are proud of our team’s efforts and are grateful to MRT Corp and MMC-Gamuda for their great support.” Sivakumar added that installation of the second section of the bridge, which connects the station to its Entrance B, would commence this weekend and was scheduled to complete on Sunday. Upon completion, the entire link bridge will be 78.64 metres long. “We are happy to be able to add value to our nation’s public transport system. There is definitely a sense of satisfaction among us – that we were the first East Malaysian contractor given an opportunity for such complex project, and that we triumphed over challenges. “In time to come, we can look back at all these with pride, that these are the products of our efforts, the efforts of an East Malaysian contractor. This is a testament that East Malaysian contractors have what it takes to be at par with the big boys,” Sivakumar said.